Here’s a quick and simple idea for Friday Family Fun: pop some popcorn, find some sugary snacks and pop a movie into the player of your choice. Such a simple pleasure, and the boys LOVE it when we do this. It’s especially delicious if you’re willing to let them stay up half an hour or an hour past their bedtime on movie night. Is there anything better than snuggling under a blanket, sharing a popcorn bowl and watching a movie together after a busy day of summer fun? To give you something new to share on your next family movie night, I’m happy to offer brand-new-in-the-wrapper copies of Diary of a Wimpy Kid and the sequel, Diary of a Wimpy Kid: Roderick Rules, thanks to our friends at GCI Group. Want to win one? Here’s how! To enter, leave a comment on this post suggesting a great movie choice for a family movie night. 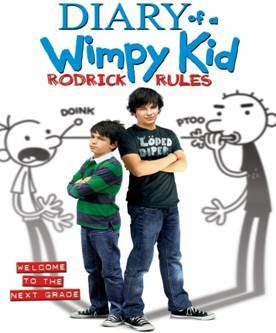 The prize is a set of two DVDs, Diary of a Wimpy Kid and Diary of a Wimpy Kid: Roderick Rules. Contest opens today, August 19 and runs through Tuesday August 23, 2011 at noon EDT. One winner will be chosen via random.org and announced on this post by Wednesday, August 24. My kids like Ramona & Bezus lately, anything by Disney, and of course any of the Toy Story’s or Harry Potter’s. Apparently Braveheart & Gladiator aren’t appropriate for 5 & 7 year-old girls, who knew? We recently watched the Steve Martin remake of The Pink Panther. I was dreading watching it, as I love the original movies with Peter Sellers. So I was surprised that we all enjoyed it. Not a bad rental. For the grown ups, you can play “spot the celebrity” – lots of stars made cameos. My 7yo loves Diary of a Wimpy Kid. We’ve seen the first movie. I didn’t realize there was a second. Awesome! My eight-year-old just finished the whole Wimpy Kid series – they have inspired him to actually read something, so I LOVE THEM. We’d love to see the movies! For family movie night we are really into Pixar – Cars or Toy Story 3 are the kids’ favourites, but we sometimes make them watch Wall-E or Up. SO GOOD. Our current favourite…well Max’s favourite is “Finding Nemo” and anything Chuggington. Amelia loves to watch anything really but her fave right now is “Despicable Me”….”I shrink the moon, I grab the moon, I sit on the toilet..” She cracks her self up each time. Anything by Michel Ocelot (animated french movies that have been translated in english, as it is on my versions of the DVDS too): Kirikou and the sorceress, Kirikou and the wild beasts, Azur and Asmar, this last one being my personnal favorite. Studios Gibli, distributed on North America by Disney, are just awesome. My neighbourgh Totoro and Ponyo being the best ones for my 5 years old daughter. Anything by Miyazaki, in fact, is worth watching, but some of them are more frightening then others. We recently watched Rio as a family and both our children (11 and 9 Monday) enjoyed it. It made my husband and I smile too as the story came to a happy conclusion. In coming up with pairs of things that go together, the one bird doesn’t get the idea when he pairs “cheese and sprinkles” Since that night I have heard laughter about that line from the kids. Thanks! Our favourite family movie right now is Yogi Bear and every time Yogi mentions a picnic basket we play a small game of “not it” and whoever looses has to get the popcorn and drink refills when we are empty. We end up having too much fun to ever get any refills not to mention that the “loser” changes so often in the movie that I end up just getting them just because we can’t remember who lost last round. Charlotte’s Web is one that both the kids and adults like for movie night. We’re reading the Narnia series now – so will be looking forward to watching those movies soon. We loved Despicable Me. My boys giggle and giggle whenever they watch it. Lion King is an all-time classic for the family! Great songs in it too! My daughter Alice loves any movie where the dogs talk. So we’ve seen all of the Beverley Hill Chihuahua movies, Dr. Doolittle, but her fav are the “Buddies” Movie (Air Buddies, Snow Buddies…)- gotta love those cute talking puppy Golden Retrievers! My son is nice and will sit through them. I guess he figures they are better than the Barbie movies! We love Despicable Me and Alladin has been getting some play lately. I really liked Mega Mind and Tangled. We all love Wall-E and classics from when I was a kid: The Muppet Movie, E.T., Star Wars, and Ghostbusters (for the older kids). My boys like Wallace & Gromit. We also recently picked up Rio 3D and the Shrek 3D series. All hits! I recently introduced my boys to an old-school favorite of mine; Mary Poppins! I love the movie HOOT!- it’s about teenagers saving little ground owls nesting in Florida–I am a Jimmy Buffett fan—an he plays a teacher in the movie and it has his songs as well as other great pieces of music us 50+ will recognize–this is from a ‘gramma’s perspective! We also love RV and Doctor Doolittle.